The going is sure to be testing at Tipperary this evening where an all-Flat card kicks off a two-day meeting. The ground is described as heavy (soft in places) for the seven-race fixture which gets underway at 5.15pm, while there is a mixed card tomorrow evening. 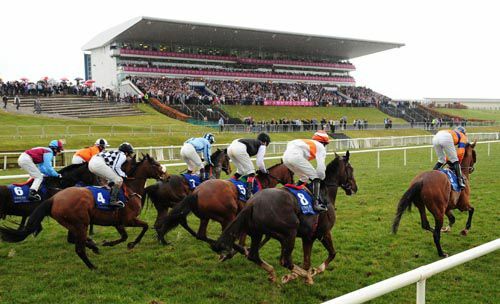 The going is currently soft (heavy in places) on the hurdle track at Tipperary. 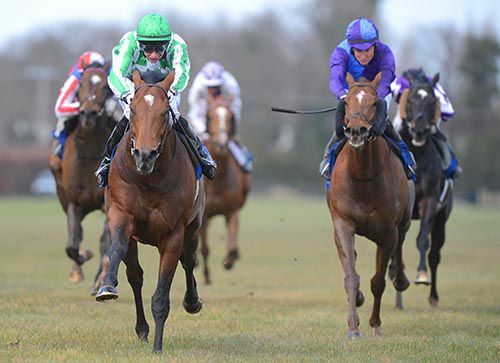 Meanwhile the Curragh hosts a potentially highly-informative meeting next Monday with the prospect of Camelot and Parish Hall meeting in the Mooresbridge Stakes. There is further Group 3 action on the card with fillies going on trial for the Etihad Airways Irish 1000 Guineas in the Athasi Stakes. The going is currently yielding to soft on the round course and soft on the straight course. Former Classic-placed colt Reply takes a big drop in class at Tipperary this evening as he seeks his first success in 19 months. Aidan O'Brien's charge was good enough to finish third behind Power in the Irish 2,000 Guineas last year, but his form tailed off since and he was last seen when last in the Golden Shaheen in Dubai last month. O'Brien also sends Line Drummer to the track for the Fundraising Events At Tipperary Races Handicap, and he will be aiming to pick up where he left off after winning a heavy-ground heat over course and distance at the end of last term. He may lack the edge over recent Limerick scorer Diesel Ten and Caesaria, who backed up his Curragh triumph with a third placing at Naas. 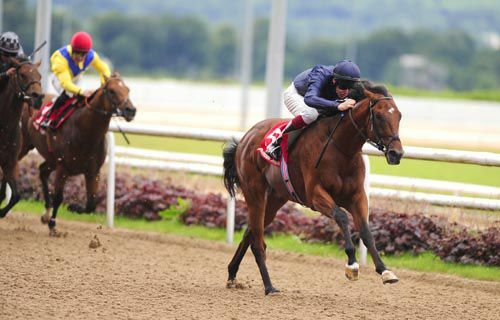 There could be several duels between O'Brien and Dermot Weld on the card, with choicely bred newcomers Freewheel and Resolute Response locking horns in the Events At Tipperary Racecourse Maiden. Weld's recent Naas victor Pay Day Kitten tackles the O'Brien-trained Kingdom in the Follow TipperaryRaces On Twitter Handicap. However, Kingdom was put in his place by Jim Bolger's Morning With Ivan when the pair clashed at Leopardstown, and a 5lb pull in the weights may not be enough for him to gain his revenge. 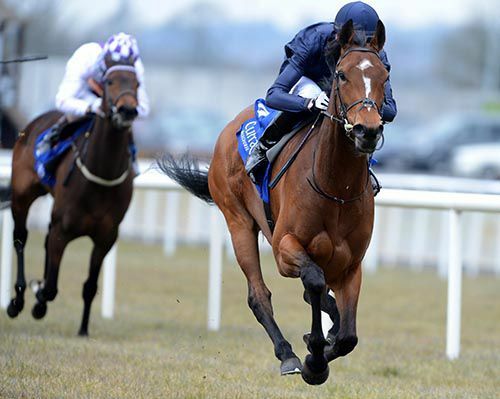 O'Brien sends two for the Book Online At TipperaryRaces.ie Maiden, with newcomer Victory Song joined by Agreement. 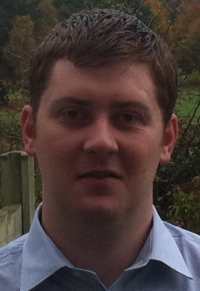 Hurricane Sky and Benalex Park both won at Gowran on Sunday and now clash under 5lb penalties in the TipperaryRaces.com Handicap, while The Four Elms is aiming to supplement a Limerick win in the Youth Raceday On 6th June Handicap. The Aidan O'Brien-trained Moth has been added to the field for the QIPCO 1000 Guineas at the six-day declaration stage after being supplemented at a cost of £30,000. Unconsidered for the race at 66/1 before her reappearance victory in a Curragh maiden, that success was evidently enough to see connections decide to throw her into the mix at Newmarket. Stablemates Magical Dream and Snow Queen have also been left in the contest as possible starters, but it is the Sir Henry Cecil-trained Hot Snap, the winner of the Nell Gwyn Stakes at Newmarket earlier this month, who heads the betting. Runner-up Sky Lantern and third-home Winning Express are set to re-oppose from that race, while another leading fancy Just The Judge was also in action at the Craven meeting - but only in order to take part in a racecourse gallop. French-trained possibles What A Name and Celtic Filly are both possible starters among a field of 18. Indian Chief showed an impressive turn of foot to win the opening race at Leopardstown this evening, the Bulmers Live Summer Racedays 2013 3yo Maiden, for Aidan & Joseph O’Brien. Sent off the 4/7 favourite, the son of Montjeu, had just one run last year finishing second to subsequent French Group 1 winner Loch Garman at Navan. His debut run was over a mile and stepped up in trip to one and a quarter miles today he was settled in rear as Dubai Deer attempted to make all under Chris Hayes for Paul Deegan. Indian Chief made smooth progress as they turned for home and once Joseph O’Brien asked him to go on, he quickly went to the front inside the final furlong, going on to score comfortably by two lengths. Dubai Deer ran a fine race to finish second at 8/1 while so did the Jessica Harrington trained newcomer Protestant, who finished a further length and a half back in third at 25/1 under Fran Berry. Aidan O'Brien said afterwards: "I was afraid as last year he ran into Jim's horse (Loch Garman) and he emptied out. "For a Montjeu colt he has plenty of speed. They went a steady gallop and he quickened up well. Being dropped in last in a slowly run race you might think it’s not the right place to be but he picked up easily. "He might be a Dante (Dante Stakes, York May 16th) horse and the fellow who won here yesterday (Battle Of Marengo) might come back here." The winner is now 20/1 (from 33's) with Stan James for the Derby. 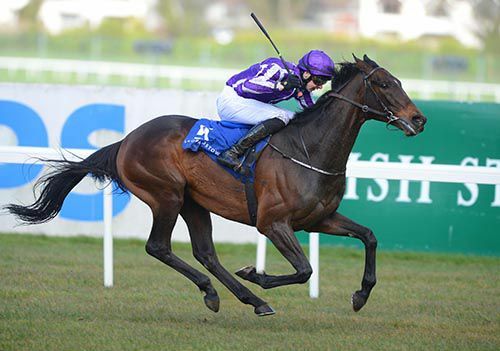 Aidan O'Brien and his son Joseph completed a treble on a good day's work for the Ballydoyle men at Leopardstown today when St Nicholas Abbey's lead horseJustification landed the concluding Leopardstown Club Members Handicap. Justification, which cost 550,000Gns as a yearling, had been absent for 233 days but showed no rustiness, wearing down front running Whatuthink in the straight before holding off that rival's renewed effort close home for a three parts of a length win. O'Brien, earlier successful with top class prospects Declaration Of War and Battle Of Marengo, later revealed “he (Justification) was leading St Nicholas Abbey at home last year so he'd a tough job! Battle Of Marengo enhanced his Epsom Derby prospects with a win in the Group 3 P.W. 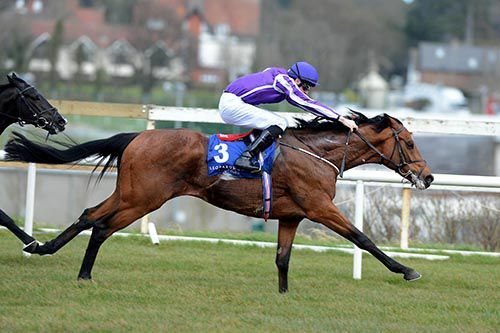 McGrath Memorial Ballysax Stakes at Leopardstown today, scoring a double on the day for trainer Aidan O'Brien and his jockey son Joseph O'Brien. The son of Galileo stretched his unbeaten record to four when readily giving away 5lbs to four rivals, improving past leader Sugar Boy two furlongs out before passing the post a length and three parts in front of that rival. Boylesports later cut Battle Of Marengo to 8/1 (from 12s) for the Epsom Derby although Paddy Power left him unchanged at 12s for the same race. The win was completing a double for Ballydoyle having earlier had success withDeclaration Of War. Testing conditions proved no obstacle forAidan O'Brien trained Declaration Of War in the Listed Heritage Stakes at Leopardstown today, earning his place in the Group 1 Lockinge Stakes next month. The son of War Front, under Joseph O'Brien, drifted markedly in the betting (from odds-on out to 6/4) as the ground became gradually worse but he quickened well to lead a furlong out before readily defeatingBold Thady Quill with 5/6 favourite Sweet Lightening well held in fourth. Aidan O'Brien concedes he is "fighting time" in his bid to get Kingsbarns to the Investec Derby. Already ruled out of the Qipco 2000 Guineas, it is hoped the winter favourite for the premier Classic could still make a Derby trial but the Ballydoyle trainer revealed any prep race would be left as close to the June 1 Epsom showpiece as possible. O'Brien told At The Races: "We dreamed he could have been a Triple Crown horse this year, but that wasn't to be. "He was always the horse we were dreaming about but things haven't gone well with him, we hoped to have him at the Curragh (to gallop) a couple of weeks ago, but he didn't make it and we are just struggling a little bit to get him 100 per cent. "He's in the pool a lot and we are trying to catch up. He's no chance of making the Guineas, anyway. "You can never be confident (of getting to the Derby) and I'd imagine it (a Derby trial) will be a late one, because it is time we are fighting with him. It (a trial) will probably be as close to the Derby as we can get because we want to give him as much time to get back as we can really. "It's far from ideal that we got stopped when we did, he was totally stopped for 10 days. We are forcing as much as we can without risking the horse because we always thought he was very special." El Salvador completed a hat-trick this year when making all in the mile and a half Summer Twilight Nights Race to complete a double on the day for Aidan and Joseph O’Brien. 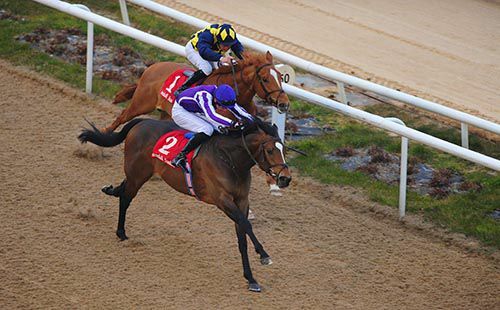 Successful on his previous two outings on the polytrack at Dundalk, the Galileo colt coped very well with the much different ground conditions here and dictated matters from the front. The well-backed evens favourite Voleuse De Coeurs travelled well into the straight but last year’s Cesarewitch winner was unable to make any inroads into the two-length advantage held by the winner. El Salvador (15/8) stayed on strongly inside the final furlong to record a two and a quarter lengths winning margin, with Chicago another five and a half lengths adrift in third. The field was reduced to just four runners after Encrypted Message (lame) and Military Bowl (change in ground conditions) were both taken out. Aidan O’Brien said, “That isn't his ground and he wants it better. There is a big engine in there and I'd say he is a fair horse. He kept picking up and picking up and he'll come back here for the Martin Molony Stakes (on June 21)." The O’Brien’s earlier initiated their double with 2/7 chance Marchese Marconi in the mile and three furlongs maiden. 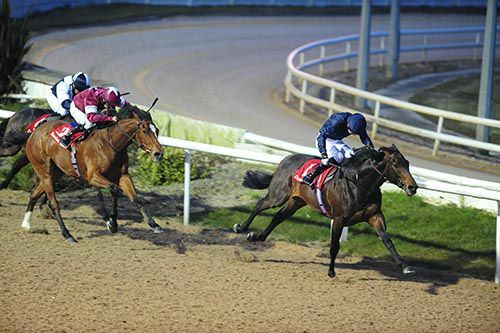 Odds-on punters had their fingers burned twice earlier in the evening but Marchese Marconi, who failed when a 1/5 favourite at Dundalk last week, had few worries in justifying odds of 2/7 in the mile and three furlongs maiden. Trained in Ballydoyle by Aidan O’Brien and ridden by his son Joseph, the Galileo colt was sent to the front off the home turn. He galloped on strongly in the testing ground to comfortably account for chief market rival Prima Vista (7/2) by four and a quarter lengths, with newcomer Vimkeeping on late to take third another eight lengths adrift. 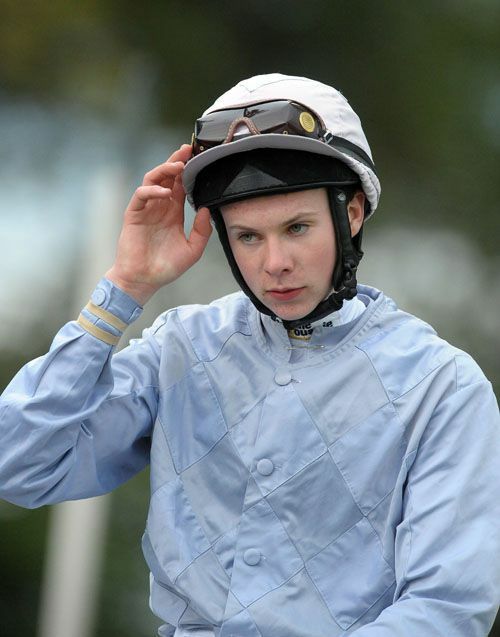 Joseph O’Brien commented, “He’s a big immature horse who will improve with racing. Hopefully he can progress up through the ranks, and who knows where he’ll wind up. He’s a fine big horse. The betting wasn't much help to punters in the four runner affair as David Wachman's Love And Cherish was the one for money, contracting into 4/5 from 6/4 this morning. In the face of that support, Count Of Limonade went in the opposite direction, from 5/4 in the offices first thing out to a starting price of 2/1. Champion Joseph O'Brien kept things simple from the front on the top-weight and he eventually won going away from Love And Cherish, by two and a half lengths. 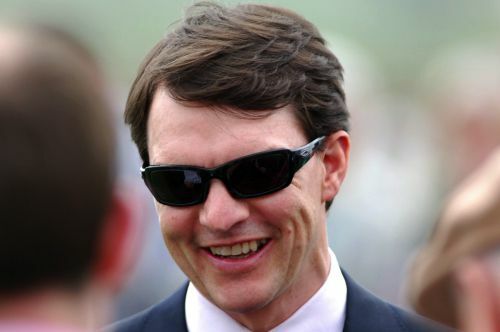 Aidan O'Brien summed up things by saying: "I'm delighted with that. Those Dukes (sire Duke Of Marmalade) seem to improve from two to three. "He won twice last year with good tough performances. The Duke was like that himself – a hardy, tough horse. "He'll step up to a conditions or a listed race and he wouldn't mind going a mile and a quarter." Master Speaker had to be asked a question or two by Joseph O'Brien but he was nicely on top at the finish to justify odds of 1/5 in the www.dundalkstadium.com Maiden. Experienced and consistent, In Salutem set out to make all and he had the hot-pot on the stretch from the two furlong pole. However the once-previously-raced Master Speaker got the message inside the final furlong and he found another gear to prevail by a length and a half. Joseph O'Brien is looking forward to partnering Declaration Of War on his seasonal reappearance in an interesting Heritage Stakes at Leopardstown on Sunday. A two-time winner as a juvenile when trained in France by Jean-Claude Rouget, the four-year-old was raced sparingly during his first season in Ireland. Aidan O'Brien's American-bred colt was ultimately well beaten by the admirable Famous Name on his Irish debut at the Curragh in September, but went on to win his next two starts, including the Group Three Diamond Stakes on the all-weather at Dundalk. He faces five rivals over a mile on his return in this Listed event, with O'Brien also saddling perennial pacemaker Windsor Palace. "I'm looking forward to riding him," said the champion jockey. "He's a massive, big horse, who takes plenty of work, so hopefully he's ready enough to do himself justice. "He won at Dundalk towards the end of last season and although he only won half a length, he did it very easy. "Hopefully the ground isn't too bad as he's really a good ground horse." Declaration Of War's biggest threat would appear to be Tommy Carmody's Sweet Lightning, so impressive in the Irish Lincolnshire at the Curragh three weeks ago. 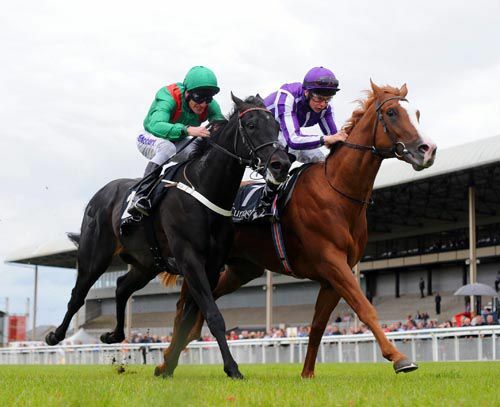 His jockey Johnny Murtagh said: "He was very good at the Curragh and he's stepping back up to Listed class now. We've been very happy with him since his last run and hopefully he'll run another good race. "There is big talk about Aidan's horse and he looks smart, so he's probably the one we all have to beat." Aidan O'Brien has mapped out an early-season plan for his dual Derby winner Camelot that will culminate with an appearance at Royal Ascot. Camelot also won the 2000 Guineas in a stellar three-year-old campaign and was just denied the Triple Crown by Encke in the St Leger, before being unplaced in the Arc. Shortly after his trip to France he developed colic but has made a full recovery and was seen moving well in a public gallop at the Curragh recently. "I've been delighted with him since he came back, he's shown all the speed and the class that he always had," O'Brien told At The Races. "I'm really looking forward to him. I think he'll come back to the Curragh for the Mooresbridge (May 6), if everything then goes well hopefully he'll go to the Tattersalls (Gold Cup) and then he might go to the Prince of Wales's. "If everything goes well that is what we are thinking for the early part of the season." 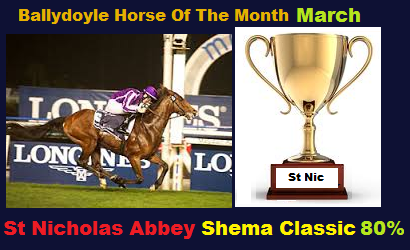 O'Brien also had news of his two Dubai winners, St Nicholas Abbey and Lines Of Battle. "Races like the Coronation Cup and the King George are likely for St Nick, we experimented a bit last year with different ways of riding him and different trips but Joseph and Derrick (Smith) were adamant he wants to be ridden handy this year and that's what they did," said O'Brien. "The plan for Lines Of Battle is the Kentucky Derby, he seems to have come out of the race well, travelled well and in an ideal world he would have preferred a better lead but that was the way the race worked out." Leopardstown host their renowned 'trial's day' this coming Sunday and it'll be another important afternoon for the Ballydoyle team as they finalise their classic plans. 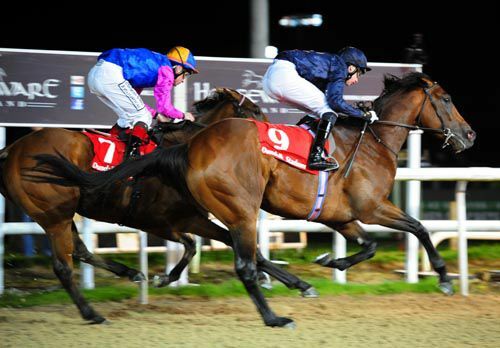 Talking after Master Speaker scored at Dundalk, Aidan O'Brien outlined plans. 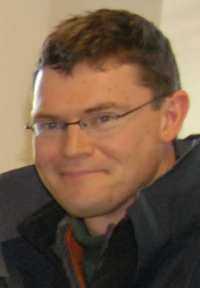 The County Wexford native said: "Battle Of Marengo will run in the Ballysax. He's in good form. We're happy with him and he's ready to start. "We've always liked him and he's progressed nicely over the winter. 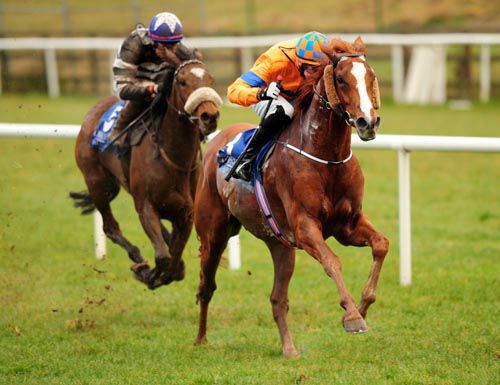 "The United States will run in the trial (the Leopardstown 2,000 Guineas Trial). He's in good form and ready to start as well. "Snow Queen (a Leopardstown 1,000 Guineas Trial contender) is in good form whilst Declaration Of War will probably run in the stakes race (the Listed Heritage Stakes). The United States bids to build on a narrow debut success last season when he tackles the Leopardstown 2,000 Guineas Trial Stakes at the Dublin track on Sunday. A half-brother to the classy filly Fire Lily, he is trainer Aidan O'Brien's sole representative from six original entries. "He's only run once and Sunday will be his first run in a long time," said his jockey Joseph O'Brien. "We're happy with him, he's ready to start off, but because he hasn't run in so long he might be a little bit rusty. That's why we're putting the cheekpieces on, just to sharpen him up a bit. Hopefully he'll run a nice race." 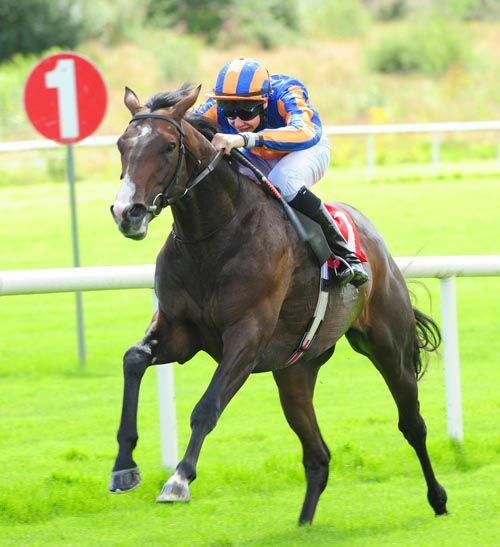 Dibayani was just a head behind The United States when the pair made their debuts at the Curragh in July. After winning his second start over the same course and distance, Dibayani was placed behind smart sorts in First Cornerstone and Battle Of Marengo in Listed races after that. His trainer Michael Halford is looking forward to the Shamardal colt returning to action. "The United States beat us in a maiden at the Curragh last year, so it will be interesting to see that line of form. We're hoping for a good run from him," said Halford. "We've been lucky in that we've not been held up. He's had a racecourse gallop so he's pretty forward." Move To Strike looked a decent type when winning his maiden by nine lengths at the Curragh in May only to run below expectations when fourth in the Chesham Stakes at Royal Ascot. "The run at Ascot is the only blot on his copybook and he's had a nice break since," said trainer Jim Bolger. "He's done well (over the winter), he's in good form and I'm happy to let him take his chance." Fort Knox led home a Richard Hannon-trained one-two-three in a Newbury maiden last October before joining Tommy Carmody's yard in County Kildare. The Dubawi colt has been doing the right things at home, according to his rider Johnny Murtagh. "He's a nice horse and won his maiden in Newbury nicely," said the jockey. "We don't know a lot about him but he seems in good shape, we're happy with him at home and hoping for a good run from him." Joseph O'Brien is hoping conditions at Leopardstown do not deteriorate ahead of Battle Of Marengo's highly-anticipated return to action in Sunday's PW McGrath Memorial Ballysax Stakes. A winner of three of his four juvenile starts, Battle Of Marengo ploughed through the Curragh mud when signing off for the year in the usually-informative Beresford Stakes in late September. However, O'Brien is sure his mount is far more effective on a sounder surface and he would prefer for the ground not to be too testing for Battle Of Marengo's three-year-old debut. "He's in good form and he's just ready to start off. If he runs a nice race, we'll be happy," said Ireland's champion Flat jockey. "I would be a little but worried if the ground went very soft. There's no denying he gets through it all right, but I've always thought he was a better horse on better ground. "He's a lovely moving horse and the day he won in Leopardstown last year on good ground, my saddle slipped, I couldn't push him at all in the straight and he still broke the track record. "For his first run back and his first run over a mile and a quarter, you wouldn't want the ground to be too bad." Battle Of Marengo is one of two runners for the rider's father, Aidan O'Brien. The master of Ballydoyle has saddled six previous winners of this recognised Derby trial, with subsequent Epsom heroes Galileo and High Chaparral both on the roll of honour, as well as the incredible Yeats. 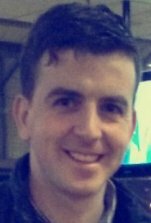 The second O'Brien runner this weekend is the Seamie Heffernan-ridden Foundry, who created a big impression when making a winning debut at Leopardstown in early November. Joseph O'Brien said: "He only had the one run towards the back-end of last year, but he couldn't have done it any easier than he did. "Seamus was very impressed with him and we were all delighted, so hopefully he'll run a nice race on Sunday as well, but Battle Of Marengo is obviously the form horse." Joseph O'Brien has allayed fears about the well being of leading Investec Derby contender Kingsbarns. The Galileo colt headed ante-post lists for the Epsom Classic throughout the winter following his thoroughly impressive display in the Racing Post Trophy at Doncaster, but trainer Aidan O'Brien revealed late last month his three-year-old had suffered a minor setback. The master of Ballydoyle effectively ruled Kingsbarns out of the Qipco 2000 Guineas at Newmarket and he has been a notable drifter in the Derby betting in the last 24 hours, with some bookmakers promoting the Sir Michael Stoute-trained Telescope to outright favouritism. However, the trainer's son Joseph, who rides another of his father's leading Derby hopes in Battle Of Marengo in Sunday's Ballysax Stakes at Leopardstown, reports Kingsbarns to be on course to take in one of the Derby trials. 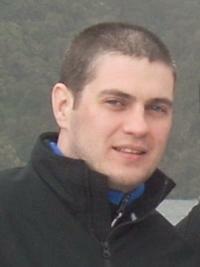 He said: "I don't think there's any change to the situation we were in before. He's back cantering and we're hoping he'll be ready to run in a Derby trial somewhere. He was working very well before he had the setback and he's an exciting horse for this year." Breeders' Cup Juvenile Turf winner George Vancouver is the star name among the 18 entries for the 2,000 Guineas Trial at Leopardstown on Sunday. Aidan O'Brien's Henrythenavigator colt - mentioned favourably by the trainer after galloping at the Curragh last month - was third to Dawn Approach in the Dewhurst before travelling to America, where he ran out a decisive winner. O'Brien has also entered Festive Cheer, Flying The Flag, Francis Of Assisi, Magician and the once-raced The United States. Jim Bolger has started the season in red-hot fashion and has Trading Leather, Dewhurst runner-up Leitir Mor, Move To Strike and Alpinist to choose from. Mick Halford's Dibayani, Tommy Carmody's Fort Knox, High Octane from John Murphy's yard and David Wachman's Fighter Squadron are other interesting contenders. 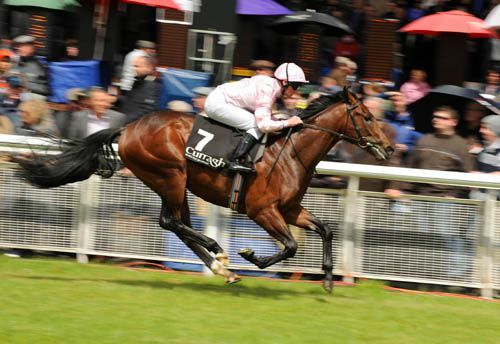 Richard Hannon's Moyglare winner Sky Lantern is one of 14 possibles for the 1,000 Guineas Trial. O'Brien is again strongly represented, with Snow Queen, Magical Dream and Greek Goddess all entered. Bolger's Bunairgead, John Oxx's What Style and Wachman's Hint Of A Tint all look promising types. Once the penny dropped Ruler Of The Worldshowed a good turn of foot to wear downManalapan in the three-year-old maiden and give Aidan and Joseph O’Brien a double at the Curragh. The winning distance at the end of a mile and a quarter was a comfortable three parts of a length and Aidan O’Brien thinks he could be a horse with a future: “I’m delighted with that horse. He had a few little setbacks and that’s why he didn’t run at two. “He’s lazy and he just does what he has to. We’ll step him up gradually. He’ll go for a conditions race next and we’ll go gently with him. Manalapan had forged on for home and only got caught close to the home. He was returned at 25/1 and was seven and a half lengths clear of St Jean in third also at 25/1. Hudson’s Bay was the uneasy even money favourite (8/15 in morning trading). He had been fractious in the parade ring and reluctant to load and finished fourth. There was an on course gamble on John Oxx’s unraced Jumaira Tower – 16/1 to 6/1. However, he was never dangerous in eighth. 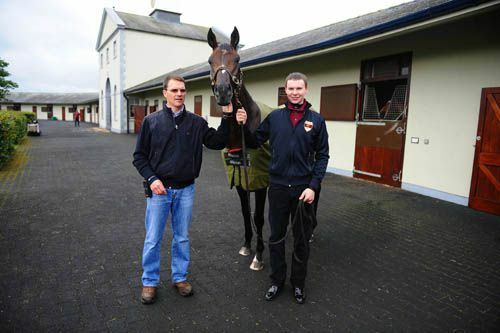 Aidan and Joseph O'Brien had a Curragh double with Moth and Ruler Of The World. Moth propelled herself into the Classic picture when running out an impressive winner of the fillies maiden at the Curragh this afternoon. Joseph O'Brien settled the Galileo filly behind the leaders in the early stages before pulling wide for a run over a furlong out. The 11/8 favourite quickened smartly to hit the front inside the final furlong and went away in the closing stages to post a four-and-a-half length winning margin. The winner had been beaten favourite on two starts last term. She could now be supplemented for the 1,000 Guineas at Newmarket. “She did it well. 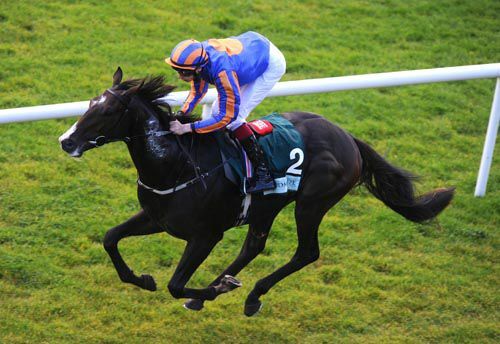 We thought she was nice last year but she got beat a few times,” said Aidan O'Brien afterwards. “Obviously I was giving the wrong instructions and instead of making use of her she should have been held up. “She's able to change gears. It was a slow run race and she came from behind which I imagine wouldn't have suited. She quickened up well. Moth has been introduced at 16/1 for the 1,000 Guineas at Newmarket by Stan James. 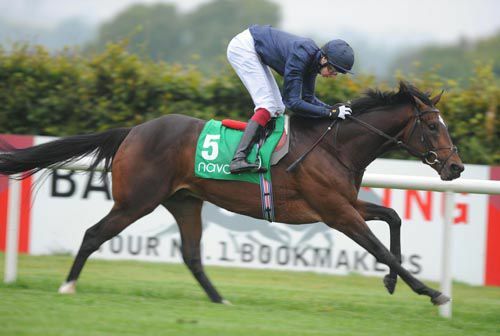 O'Brien also reported his colts on course for the 2,000 Guineas at Newmarket.